Shoplifting is a bane for retailers. Inventory shrinkage cost the U.S. retail industry almost $47 billion in 2017, which are the latest figures from the National Retail Federation as of February 2019, and much of that shrinkage was the result of shoplifting. All retailers, big and small, are affected by shoplifters; it's a frustrating reality of doing business. Store design and theft-prevention methods such as security cameras and alarms can help defray losses. But it's a good idea to train store personnel on how to spot shoplifting before or while it's happening. Many professional thieves work in groups of two or more to distract sales staff while they steal. 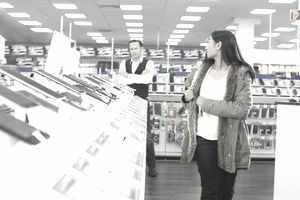 Shoplifters learn to take advantage of busy stores during peak hours, or they may strike at times when employees are likely to be busy, such as opening, closing, and during shift changes.